Once the home of famous gangsters like Al Capone, this legendary island in San Francisco Bay boasts a colorful history as the West Coast's first lighthouse, Civil War fortress, infamous federal prison, and bird sanctuary. 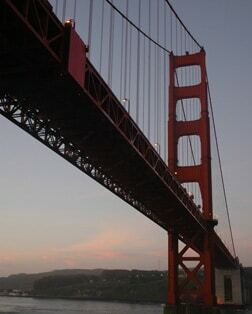 One of the world's most iconic structures, the Bridge was the world's longest from 1937 to 1964. Painted "International Orange," Golden Gate refers to Golden Gate Strait, the entrance to the Bay from the Pacific. A remnant of ancient coastal redwood forests that covered many northern California valleys, Muir Woods is home to the world's tallest trees; at 500 to 700 years of age, they're also some of the oldest. Hugging the hills above San Francisco Bay, this charming city boasts unique art galleries, spectacular views of the bay and an historic waterfront, which was once a bootlegger's paradise for gangsters like "Baby Face" Nelson. A 45-acre complex near Fisherman's Wharf, Pier 39 is the hot spot for eating, shopping, strolling and soaking up the breathtaking views of Alcatraz, the Golden Gate and Bay Bridges, and the city skyline. The docks of Pier 39 are also home to hundreds of sea lions. You don't have to be a wine expert to appreciate the serene beauty of two of Northern California's most popular destinations. Tour the region's 400 wineries by limousine, horse and carriage, bicycle, jeep or bus. One of San Francisco's oldest restaurants, the history of this fabled site begins in the mid-1800s when the original building stood precariously high on the edge of a cliff overlooking Seal Rocks. One of the many breathtaking sights of the Golden Gate Bridge can be enjoyed from the north vista point. At mid-span, the pedestrian walkway hovers 220 feet above the water's surface.